(Newser) – "The sarcophagus has been opened, but we have not been hit by a curse," declared the head of Egypt’s Supreme Council for Antiquities after opening a huge black sarcophagus that had been untouched for 2,000 years. Those prone to queasiness might have disagreed. 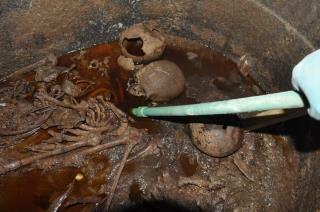 Sewage water had leaked into the Alexandria sarcophagus over the centuries through a crack, meaning that instead of well-preserved mummies, antiquities head Mostafa Waziry and his team found three skeletons, a vile red liquid, and a terrible smell when they opened the sarcophagus, the Guardian reports. Why the need to find Alexander the great's remains? Let the dead be.